Bust commemorates Ernst Mueller, a sharebroker and mining investor who died in 1910. 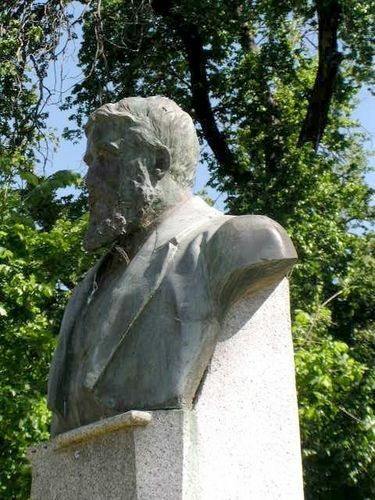 One of the principal functions to be performed on Saturday next in connection with Wattle Day, will be the unveiling of the Ernst Mueller memorial statuette in Rosalind Park, near the View Point entrance. The bust is of bronze, and is by Mr. James White, the sculptor of the fine statue of Queen Victoria. This bust is to be mounted on a pedestal of marble and granite polished and fashioned by Messrs. P. Finn and Co., of Mitchell Street. A concrete foundation is to be 6ft square, and immediately on top will be one flight of steps 4ft 10in x 4 ft 2in, with a base of granite supporting a rustic die with angle drafts. On top of that comes a moulded cap which will set the main pedestal off to great advantage. The completed structure will be 12 ft high. Bendigo Independent (Vic), 27 August 1914.